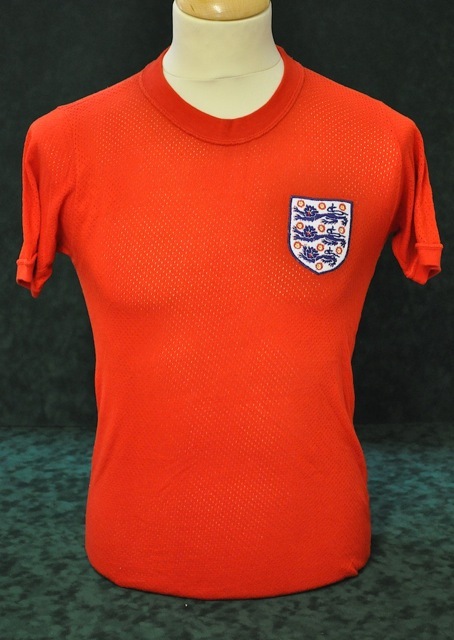 England first wore this special lightweight summer version of their red away kit in the 3-2 World Cup final tournament extra-time loss to West Germany in 1970, after their designated change kit of all blue had not provided enough contrast to Czechoslovakia's all-white kit in their previous game. 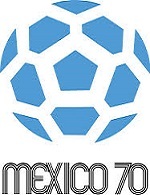 It was made of the same aertex material as their other kits worn in Mexico, though the emblem had a white background, (i.e. not the same colour as the shirt, unlike on the white and blue shirts) and the white shorts, too, were aertex. After leaving Mexico, England reverted back to their long-sleeved white and red shirts and it wasn't until 1973 that they saw a need to revive short sleeves. A yellow change kit was introduced and quickly discarded. Then, in 1974, England re-introduced the short-sleeved red aertex shirts last seen in Mexico, before Admiral negotiated a contract to supply the FA and developed their own lightweight shirts for the warmer months. The above shirt (left) was worn by Sir Trevor Brooking against East Germany, in 1974, and it appears here by kind permission of the National Football Shirt Collection (England Match Shirts), also part of the Neville Evans Collection (curator Simon Shakeshaft). Alongside it is the number 16 shirt worn by Malcolm Macdonald on the substitutes' bench against Bulgaria and is part of Richard Clarke's 'Three Lions - England Match Worn Shirts' Facebook Collection. Notes England wore the red away shirt with the white away change shorts, but wore the white home socks against Bulgaria.